HEIRLOOM. This mix has an incredible color range. Today, sweet peas remind one of a Victrola in the parlor. Considered very romantic, some antique strains can be wonderful if chosen carefully; others can be duds. We've selected only the best for you. 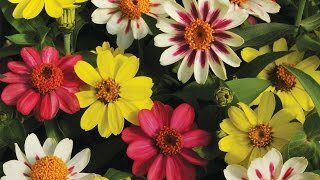 All have a slight honey or orangey aroma and make excellent spring cut flowers. Henry Eckford, the father of modern sweet peas and the leading developer in the late 1800s, produced over 100 varieties. This mix of his best has an incredible color range: shell pink, maroon, violet, cream, blue and crimson striped with white. Sweet Pea, Eckfords Finest Mix is rated 4.7 out of 5 by 3. Rated 5 out of 5 by SLHH from Sweet Peas in Arizona I buy sweet pea seeds in the Spring for planning in the late Fall. They sprout and grow all winter and provide a large crop of blooms in late February through May. The Eckfords Mix produces an excellent variety of color with long stems for cutting. That mix is going back in the bed this Fall! Rated 5 out of 5 by turtle from Great for cut flowers I am giving this sweat pea mix five stars, though they have just started flowering. Living in New England, I planted them in March, and I am just now enjoying their blooms, which is typical this far north. The flowers are lovely, and have very long and elegant stems, so they are easy to add to bouquets or on their own. Exquisite scent! Rated 4 out of 5 by pansylady from spectacular sweet peas I planted Eckford's finest mix in April- they have been blooming non-stop since the end of June- it's now August 19, and they are showing no signs of stopping! The plants are vigorous, the color mix is attractive, and the smell is to die for! Highly recommended!